Our "long-glide" design features all-steel encased ball bearings and engineered lubricants to create the longest, smoothest glide available. 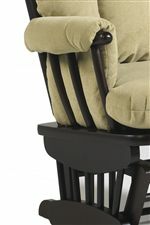 Optional 10-position glide lock secures the chair for easy entry and exit as well as maximum reclining. 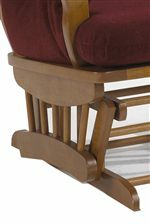 With its button-tufted back, this glider rocker brings a traditional style to your child's nursery or bedroom. 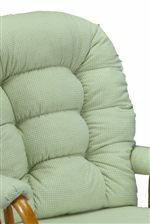 Its smooth, long-glide mechanism lets you lull your newborn into a sweet slumber, while plush seat, back, and arm cushioning wraps your body with superior comfort and support. Pair with its matching glide ottoman for head-to-toe comfort and coordinating style. Available with a 10-position glide lock for ease of entry and exit. The Storytime Glider Rockers and Ottomans Sona Glider and Ottoman Set by Best Chairs Storytime Series at Best Home Furnishings in the St. Louis, Chesterfield, St. Charles, MO & Waterloo, Belleville, Edwardsville, IL area. Product availability may vary. Contact us for the most current availability on this product. Sona Sona Glider Rocker 1 29.5" 34" 41"
Ottoman Ottoman 1 20" 17" 16.5"
The Storytime Glider Rockers and Ottomans collection is a great option if you are looking for Transitional Traditional furniture in the St. Louis, Chesterfield, St. Charles, MO & Waterloo, Belleville, Edwardsville, IL area.